In contrast to PHUNT, Bandera was run under perfect conditions. Again let me remind you that this race was Kino’s fault #kinosfault. I don’t really get nervous for races anymore unless they are 100 milers. Those still make me anxious but this 100k had me worried. Would I be able to handle such a difficult course? 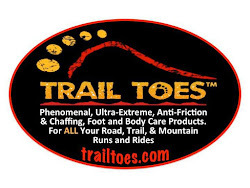 In addition, some of the best trail runners in the country would be there. How would I stack up to these runners? What if my knee acts up again? I can handle it for a 50k (PHUNT took 6 hours 45 minutes in the snow to complete), but twice that distance? Would I have my first DNF? In San Antonio, the night before, we meet Kino’s roommate Evy Gonzales at their friend, Edgar Gonzalez’s (no relation, this is Texas) running store called We Run San Antonio. We hung out in the store lounging on the couch and drinking seltzer. “OK” I think, maybe this race won’t be so bad. Edgar warns us about the Texas Sotol. Aloe plant-looking cactus, whose tiny needles cut your skin ever so gently without you noticing until you see the blood on your legs. They line the course at Bandera. OK, this I can deal with but I don’t think I can handle another bad race, another race I want to end as soon as it starts, another race where I don’t perform as well as I want to. I decided then and there that this was going be a good race. I was going to do my best and have fun doing it, whatever the outcome. Any ultra runner will tell you that during an ultra it’s mostly mental, so why couldn’t I use that same ultra mentality I try to use during the race before the race? Race morning. I awake at 4am in the Gonzales household in San Antonio with less than 4 hours of sleep (after the previous night of only 2 hours of sleep). Evy, Kino and I throw all of our stuff in the car and head out to Bandera, one hour away. Kino and I had decided our best case scenario would be to aim to finish in 14 hours. At the very least we would aim for under 16 hours which would be a Western States qualifier. We arrive at the Hill Country State Nature Preserve in Bandera in darkness. We happened to park right next to Kino’s friend Chikara Omine who placed 2nd Overall in 2010 at Bandera. (SPOILER ALERT: he will place third this year!) I fumble around in the car for the right gear for what seems like forever. We make our way to packet pickup. The sky grows a bit lighter as it reminds me that the 7:30am start time is growing closer. I have to pee badly, but there is no time because I have to put on not one, but two bibs! Are you kidding me? 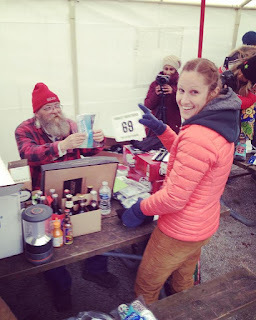 One is my bib number 88, the other bib was to be worn on my back to let other runners know what age division I was in, as Bandera was also the USATF National Trail 100k Championship race this year. Once again Kino and I find ourselves scrambling last minute to get somewhere, the start line. It’s 7:29am as we line up in the back of the pack. Bandera starts right on time, but I still have to pee! As the 254 other 100k runners take off into the trails I stop at the porta potty and so does Kino. When we emerge seconds later and run towards the pack in dead last place! We pick off the slower runners very quickly at first until I remind Kino this is a 62 mile race and we had agreed our strategy would be finish the first 50k loop feeling good. I’m not sure at what point exactly, but I remember thinking early on that this was truly going to be that awesome race. I was trying to will it to be. I felt good. The scenery was beautiful, the weather was perfect, I was in good company and what do you know, I was having the time of my life! Kino and I super hiked the ups. He flew down the descents and in contrast I gingerly tip toed my way down. 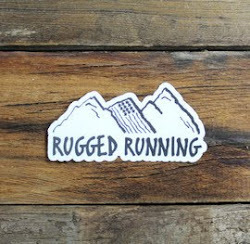 Note to self: become a better trail runner. Work on my downhill technique and hills. On the flats, I would catch up to him as the heat started to get to Kino. He hung in there as we finished our first 50k loop in 6:08. We noticed we would pass runners, only to be passed by them again at an aid station. We decided we needed to try to be quicker at the aid stations. Twelve minutes later, we head out on our second loop (eh, we said "try"). We had 7 hours and 40 minutes to finish our last lap. I felt so good leaving on that second lap, like I was starting out fresh. I thought, for sure, a 14 hour finish was in the bag. It’s so difficult, on trail runs, to take in your scenery, as you have to diligently watch the ground in front of you and especially on trails this technical. I made sure, though, to “stop and smell the Texas Sotol” a few times. And then it happened, somewhere around mile 49 or so, I fell in love with running all over again. It was on a steep climb, being hit in the thighs by the beloved Texas Sotol, that I looked up and saw a setting sun going behind the hills. The light around me was indescribable. It’s that light at dusk that only lasts for a few minutes that makes everything look fake, like a painting and not real life. That moment is why I run; and for moments like them. It was all about the journey again. It’s about the people you meet along the way, like Jeannie Bennett, a runner from Oklahoma whom I had met doing the Center of the Nation Series (5 marathons in 5 days in 5 states). Our paths cross again here in Bandera, Texas. She’s fast and was attempting her first 100k after completing JFK 50 in around 8 hours. It’s about people like Dave James, who literally gave me the shirt off his back when my ultra tiny Bandera jacket didn’t fit me; the guy standing near the heat lamp in the finish tent at 10pm that moved aside to make room for me, so I could be warm; the volunteers; the stories; the tired, but accomplished feeling; the nausea, pain, highs and lows and all the stuff good or bad that comes with ultra running; all the things that make each journey unique and special. After I left the Crossroads aid station for the fourth and last time, I knew it was time to kick into high gear. Only one more aid station and two more major climbs before the finish. Kino told me to go and that he would catch up, so I start running alone in the dark, feeling like I’m floating across the ground. Once Kino catches up, we make good time. After the last aid station is when I finally hit my low, and my left foot and right shin start acting up. Each step is very painful; it feels like my foot and shin are on fire. But we are almost finished so we run on. The last 4 miles seemed to last forever, but I’m not going to complain that I finally hit my low at mile 58. Kino is flying down the switchbacks now and I hold on. Finally the ground levels out and I know one more turn and then the finish. We start sprinting once we hit the grass and see the porta potties. Never have I been so elated to see a porta potty! One more left turn and we can see the clock! 13:19: 54!!! We sprint as we just started trying desperately to cross before the clock left the teens. We cross in 13:20:01 gun time. 50th and 51st finishers overall. Having a companion for the entire 62.2 miles made the distance feel easy. We passed over 200 runners since the start at 7:30am, and finished 40 minutes ahead of our best case scenario time goal. 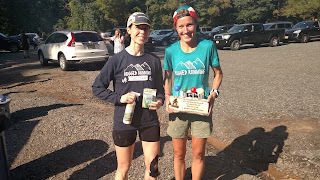 To add to this already perfect race, I finished 8th place female in the USATF championship 100k trail race. I accept my USATF 8th place medal and my first ever belt buckle. Even though it was my 5th time running a distance of 100k or more, I had never received a belt buckle. The buckle was glorious. So shiny! I love it even though it has a gross snake on it. We make our way to the heated finish tent and I mix my Hammer Recoverite and chat with other runners. 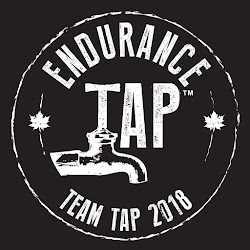 This is one of my favorite parts of ultra running; swapping war stories with other runners afterwards, sharing training tips, thanking the race director and volunteers for working so hard to make this all possible, and just soaking up the race ambiance in general. By the time we head out, it’s about 11:30pm and we start the hour drive back to Fort Gonzales in San Antonio. Kino drives as we marvel over how well the race went for us. I know I’m gonna be in a world of hurt tomorrow when I wake up, but it’s all worth it. You take the good with the bad. Like all ultra runners we have selective memories and only remember the good feelings, kind of like how mothers forget the pain of child birth, or so I hear. If they remembered only the pain, they probably wouldn’t have another child. In a way this is just like ultra running. We forget the pain or the pain becomes a fond memory as we look forward to our next excellent adventure! Rocky Raccoon 100, here I come!!! Excellent, Excellent Recap for our 13hrs 20mins together in Texas Hill Country. Thank you for putting all the memories down into words b/c these memories would have been lost. Don't forget about Bill Cosby, #comeandtakeit, & #Perpooteum.